Furosemide is a diuretic used to treat fluid retention (edema) in dogs and cats with congestive heart failure, liver disease, or certain kidney disease. Furosemide is also used to treat high blood pressure. 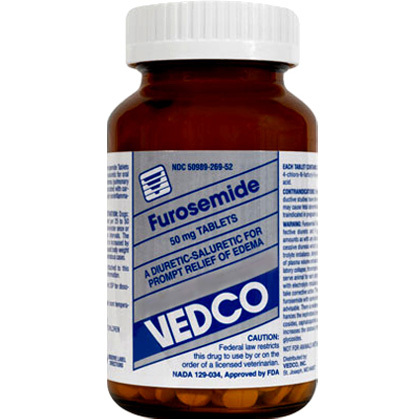 Furosemide for dogs and cats is sold as 10 mg/ml 60 ml bottle oral solution or by the tablet and requires a prescription from your veterinarian. How does Furosemide (Salix) work? Keep plenty of water available for your pet to drink. Furosemide can make your pet's skin sensitive to sunlight. There are possible adverse interactions with other drugs, so fully disclose to your veterinarian what you are giving your pet. This medication should not be used in pregnant or nursing animals. What is the most important thing I should know about Furosemide (Salix)? Do not give this medication if your pet is not urinating. Tell your veterinarian if your pet has kidney or liver disease, diabetes, or an allergy to sulfa drugs. Furosemide can make your pet's skin more sensitive to sunlight and sunburn may occur. Periodic blood tests, as well as kidney or liver function tests, may be necessary. Furosemide will make your pet urinate more often. Your pet should have drinking water readily available to prevent dehydration and electrolyte imbalance. Furosemide is a loop diuretic (water pill) used to treat fluid retention (edema) in dogs and cats with congestive heart failure, liver disease, or certain kidney disease. Furosemide is also used to treat high blood pressure. Furosemide is available by prescription as Furosemide Oral Solution containing 10 mg/ml, and in 12.5 mg (round yellow), 20 mg (round white), 40 mg (round white), 50 mg (round yellow), and 80 mg (round white) tablets. The usual dose of furosemide in dogs and cats is 1-2 mg/pound once or twice a day (at 6 to 8 hour intervals). Cats will usually get the lower dose. Higher doses can be given depending on the severity of symptoms. Discard the opened bottle of Oral Solution after 90 days. Furosemide may also be used for purposes other than those listed here. What should I discuss with my veterinarian before giving Furosemide (Salix) to my pet? Do not give this medication if your pet is not urinating. Tell your veterinarian if your pet has kidney or liver disease, diabetes, or an allergy to sulfa drugs. Tell your veterinarian if your pet is pregnant or lactating. How should Furosemide (Salix) be given? Give this medication exactly as directed by your veterinarian. Do not give larger amounts, or give it for longer than recommended by your veterinarian. Your veterinarian may occasionally change the dose to make sure your pet gets the best results from this medication. Furosemide will make your pet urinate more often, so your pet should have drinking water readily available to prevent dehydration and electrolyte imbalance. Periodic blood tests as well as kidney or liver function tests may be necessary. Store this medication at room temperature away from heat, light, and moisture. What are the potential side effects of Furosemide (Salix)? What happens if I miss giving a dose of Furosemide (Salix)? Furosemide is sometimes used only once, so that there may not be a dosing schedule. If you are giving furosemide regularly, give the missed dose as soon as you remember. However, if it is almost time for the next dose, skip the missed dose and wait until the next regularly scheduled dose. Do not give a double dose of the medication. What happens if I overdose my pet on Furosemide (Salix)? Seek emergency veterinary medical attention if you believe you have given your pet too much medication. Symptoms of furosemide overdose may include loss of appetite, weakness, dizziness, confusion, fainting. What should I avoid while giving furosemide? Avoid allowing the pet to become dehydrated. Keep plenty of water available for the pet to drink. Furosemide can make your pet's skin more sensitive to sunlight and sunburn may occur. What other drugs will affect Furosemide (Salix)? If you give your pet sucralfate (Carafate), give it at least 2 hours before or after giving furosemide. Tell your veterinarian if your pet is being given digoxin (Lanoxin), steroids (such as prednisone), other blood pressure medications, Amikacin, gentamicin, tobramycin, salicylates such as aspirin (Vetrin), or indomethacin. Drugs other than those listed may also interact with furosemide. Tell your veterinarian about all the prescription and over the counter medications you are giving your pet. This includes vitamins, minerals, and herbal products. Furosemide will make your pet urinate more often than usual so your pet should have drinking water readily available to prevent dehydration and electrolyte imbalance. Do not give larger amounts of this medication, or give it for longer than recommended by veterinarian. Your veterinarian may occasionally change the dose of this medication to make sure the pet gets the best results from it. Periodic blood tests as well as kidney or liver function tests may be necessary. The usual dose is 1-2 mg/lb of pet's body weight given once or twice daily (at 6 to 8 hour intervals) or as directed by your veterinarian. Cats will usually get the lower dose (1 mg/lb of pet's body weight once a day).